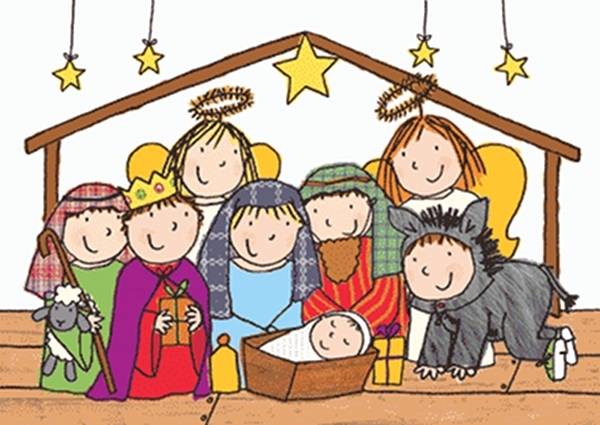 Do you remember the Nativities you were involved with as a child? I have vivid memories of going to school in my pyjamas when I was 7 years old…and the song…”Girls and boys, leave your toys, make no noise, kneel at His crib and worship Him…” I can still remember most of the words! My worst experience was at Sunday School. There was a lack of boys in the group and they needed a Joseph…I can’t tell you the embarrassment of being a 12 year old girl being forced to be Joseph in the Nativity…the only saving feature is that they made me wear a beard – and so at least I wasn’t that recognisable. My brother took the mickey out of me for ages after that! 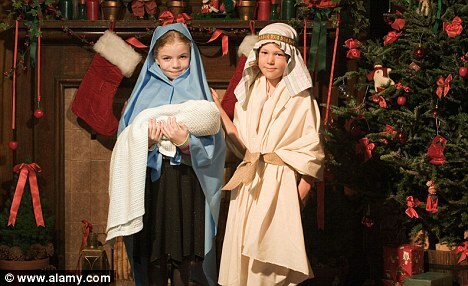 Finally, in my last year at primary school I got to be Mary, with lines to learn and everything. My best friend was angel Gabriel, but we kept being late for before-school rehearsals and were threatened with the sack! We weren’t sacked in the end, phew! My mum remembers this performance with pride, but only because I carried on courageously as the scenery collapsed around me…and stood my ground as I refused to hold Joseph’s hand as we walked around the school hall on our way to Bethlehem! We all remember the Nativity and children everywhere are going through the same story these next few weeks. for many of them it will be the only time they hear anything about God’s Son Jesus and let us pray that seeds will be sown as they wonder who this baby was and what relevance he has to their lives. 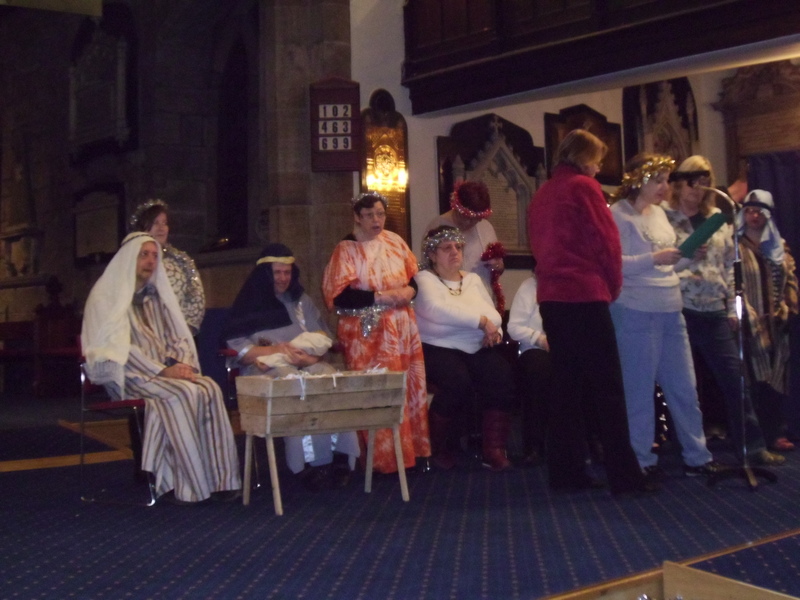 Churches too are gearing up for the celebration….and we too, at the Good News Group are getting ready to share our version of the wonderful story this Wednesday. Please pray for us. It is our main outreach of the year and we encourage all our members to invite their friends, housemates, families and carers to come and share in our joyful celebration. All our members are involved and doing something, reading, praying, acting, puppeteering and the tableau that we will create as we go along will not leave a dry eye in the church! Here’s a photo or two of our service last year, and if you are local – come and join us 5.45pm start, Leyland St Andrew’s church! The Wise Men visit the stable. 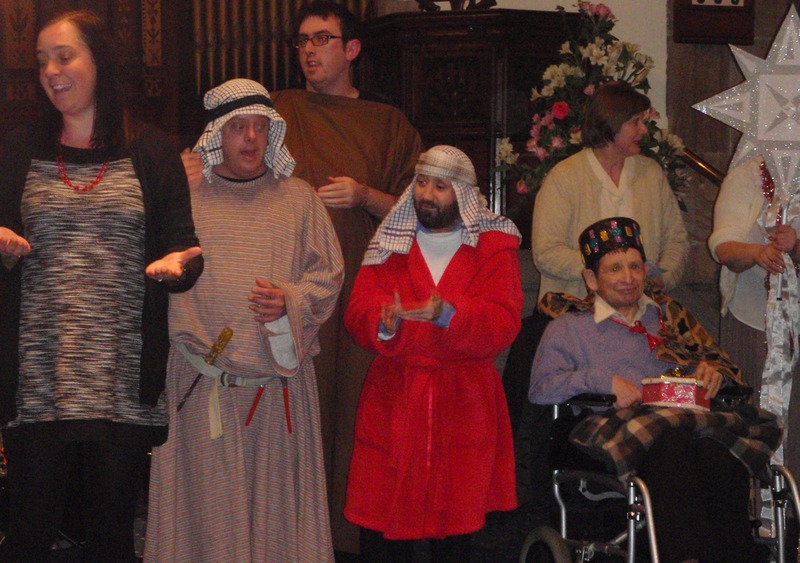 As promised here are some pictures of our Christmas Carol Service. All our members took part and really enjoyed themselves. Even those who didn’t want to come out to the front still dressed up or put tinsel in their hair! The purpose of this service is for us to encourage our friends and families to join us in learning the message of Christmas – that Christ was there in the beginning and came into our world so that he could die, rise to life and open up the way for us to be friends with God once again. Thank you to everyone who prayed for us and everyone who came along and supported us. The church felt quite full and so many of you even joined in with the signing of our carols. You all did great. We are hoping we may get a couple of new members which would be so wonderful. Now just the Christmas party to go this Wednesday…apparently I have to take a photo of me as a baby and someone is making rather a lot of pass the parcels…going to be fun!